Finally, an uneventful but rewarding day of travel. I’ve gotten my cold under control, the roads are well paved and with one small exception, I knew where I was going most of the day. I got up early as usual and was out on the streets to explore Veracruz well before daylight. Veracruz was the primary port city of Mexico during the 1500’s when first Hernando Cortez, and later Ponce de Leon, arrived to settle and govern what was then referred to as “New Spain”. It’s now a clean, bustling, cosmopolitan maritime city of roughly a half million people. The Mexican Navy Academy is near the hotel where I stayed. It was pristine as I suppose a Navy facility is expected to be. 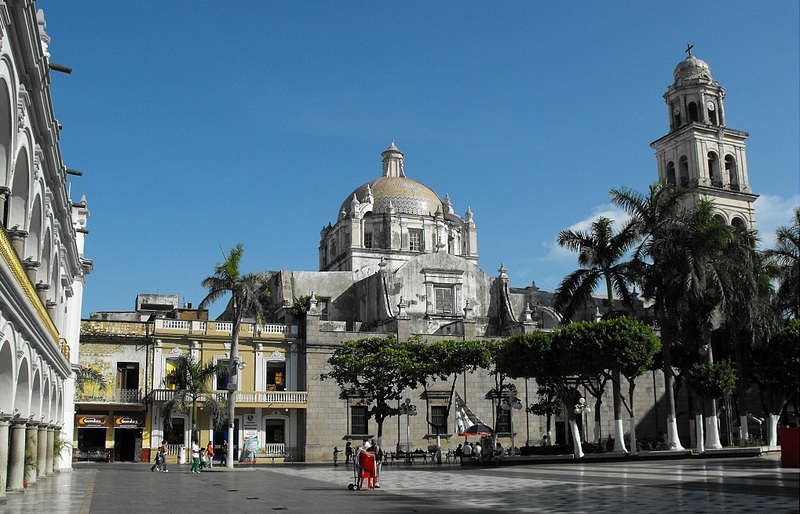 One of the most eye-catching structures in Centro Veracruz is the Cathedral de Veracruz. 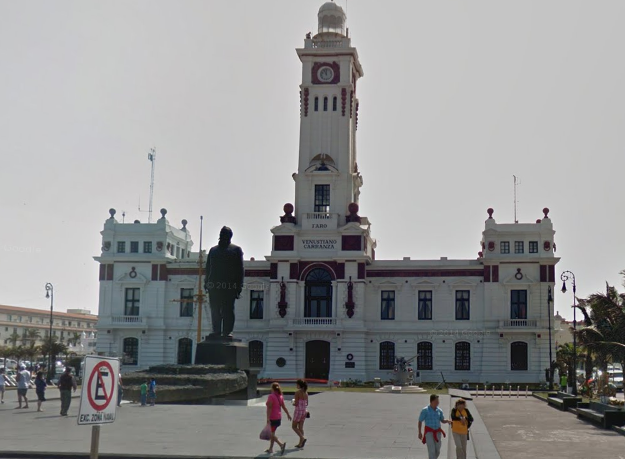 Another site that was within walking distance of my hotel is the Museum of Naval History of Veracruz, named in honor of Venustiano Carranza who was a political leader during the Mexican Revolution in the early 1900’s. I was anxious to get within striking distance of the border into Guatemala so I didn’t spend as long a time in Veracruz as I would have liked. I got back to the hotel with my car about 9 am and grabbed my bags and checked out. 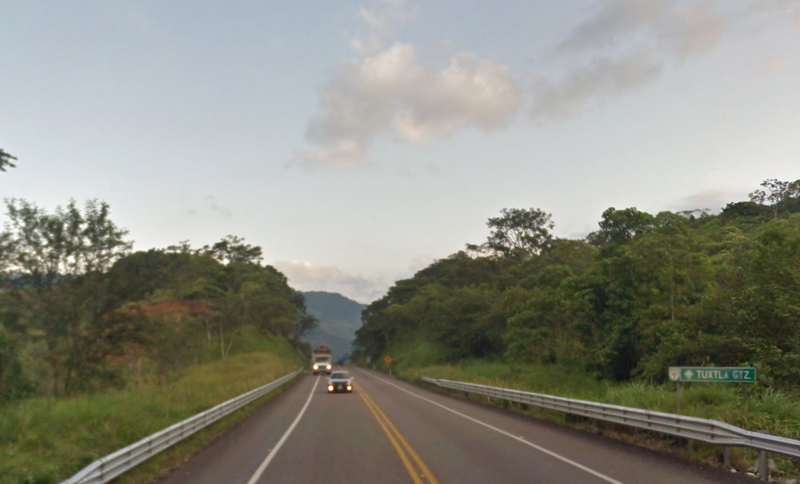 I’ll be following highway 180 out of Veracruz to Acayucan where it intersects with highway 1450 heading inland to the west where I’ll cross into the Mexican state of Chiapas before turning south again on highway 190 through Tuxtla and then into San Cristobal de las Casas. 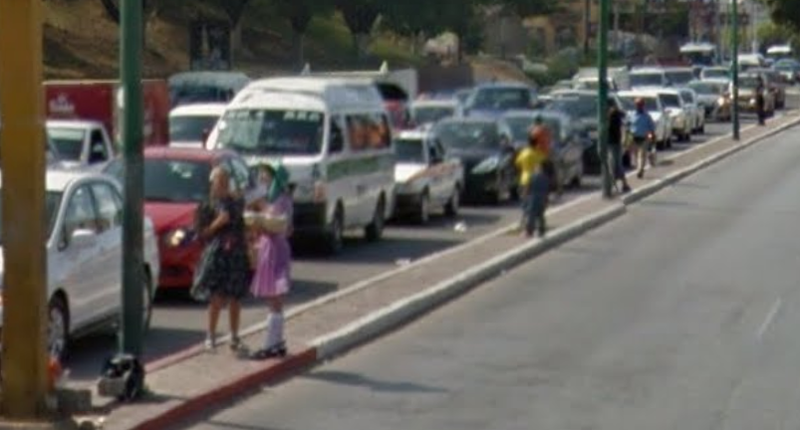 It’s become apparent to me at this point, that southern Mexico is much more settled and civilized than northern Mexico. It is unfortunate that so much of our understanding of Mexico comes from the socio-economic situation as it exists in northern Mexico. The roads have been much better since I got past Tampico and they were excellent all the way from Veracruz to San Cristobal. By mid-afternoon, I was crossing the Rio Grijalva which was damned to create the Malpaso reservoir leading to the loss of a number of historical and archeologically important sites. After crossing the Malpaso I began climbing up into the mountains. It reminds me of the frequent weekend drives that we took as a family into the North Carolina mountains to poach rhododendron from the roadside or search for the big one at the Ruby mines. I’ve noticed that the buses are getting more plentiful as well as more colorful. There are far, far more Latinos traveling by bus than by car. This is true both in the city as well as for longer trips. On the highways, it seems that all you need to do is stand by the side of the road with your bags and the bus will stop and pick you up. No need to travel to a terminal to catch a ride. The only mishap during today’s travel was another Garmin misrouting. 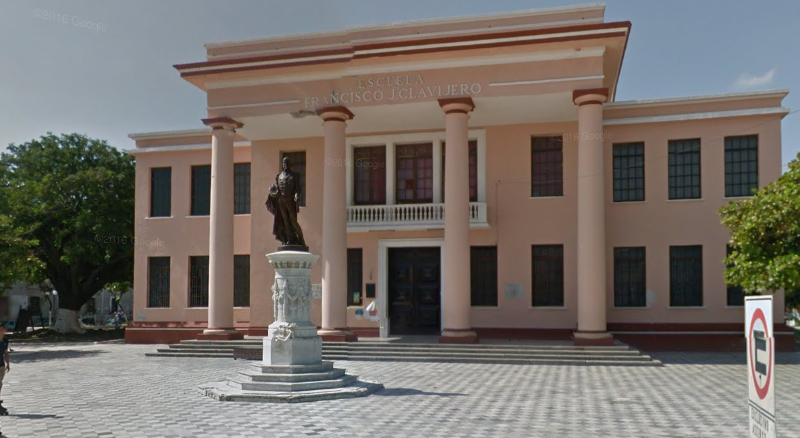 The GPS recognized San Cristobal but all of the POI data was for Tuxtla about 75 kilometers north of San Cristobal. 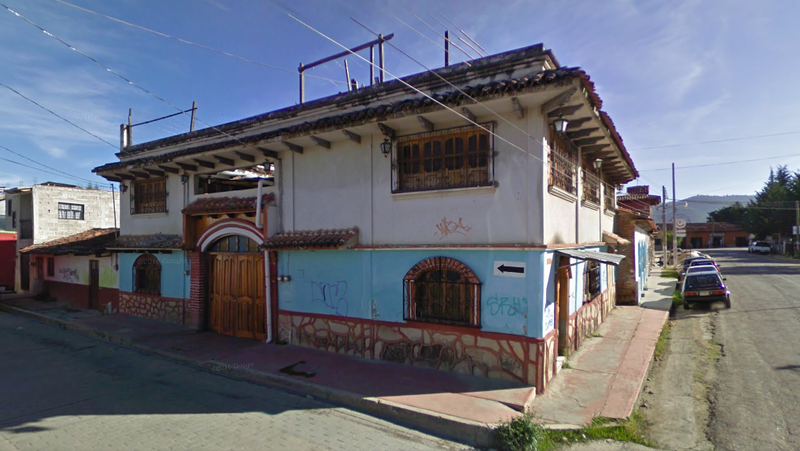 So, when I selected a hotel in San Cristobal as a destination target, it routed me directly into downtown Tuxtla. As usual, I didn’t realize what was happening until it was too late so I was caught driving in circles trying to get out of Tuxtla and find the highway on to San Cristobal. 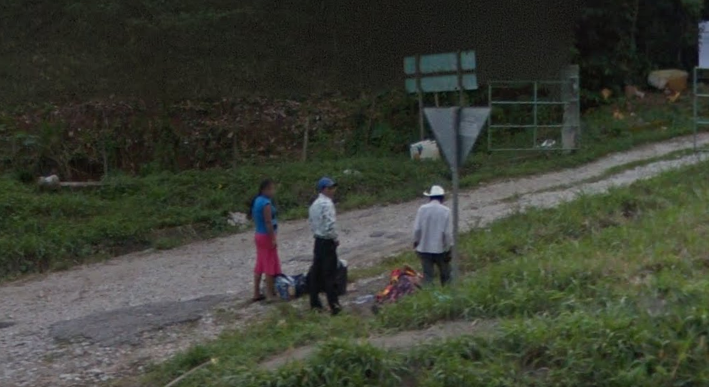 That cost me about an hour and caused me to do the one hour drive from Tuxtla to San Cristobal in the dark. I regret that because the drive between the two cities goes straight up high into the Sierra Madre mountains. I am sure it was a beautiful drive. The only consolation was getting to see the lights of San Cristobal from above as I entered the city around 7:30 pm. San Cristobal is a beautiful city. It was founded in the early 1500′s and many of the streets and buildings date from hundreds of years back. The sidewalks are very narrow as are the streets. The sidewalks are paved with smooth time worn bricks. I found a reasonably priced local hotel and had enough energy to get out for a walk in the square, have a cocktail and find a nice sidewalk cafe for dinner. The city is packed with tourists from everywhere. 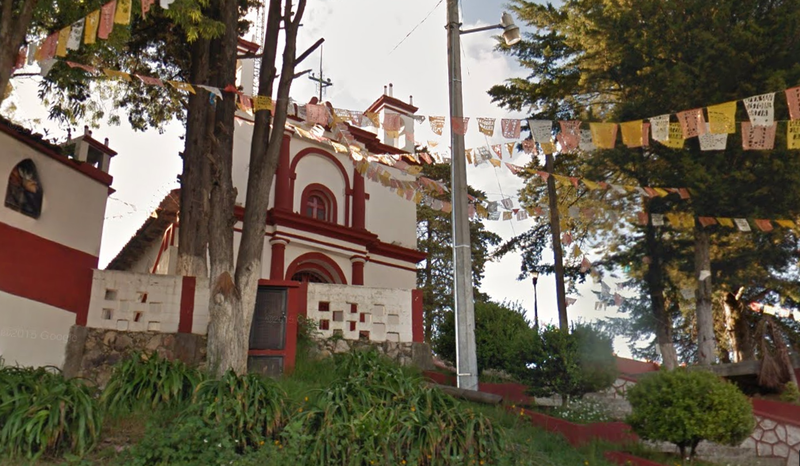 The resident population is heavily influenced by Guatemalans and Mayan culture. For the tourists, the colorful knit Peruvian style caps with earflaps are the rage. 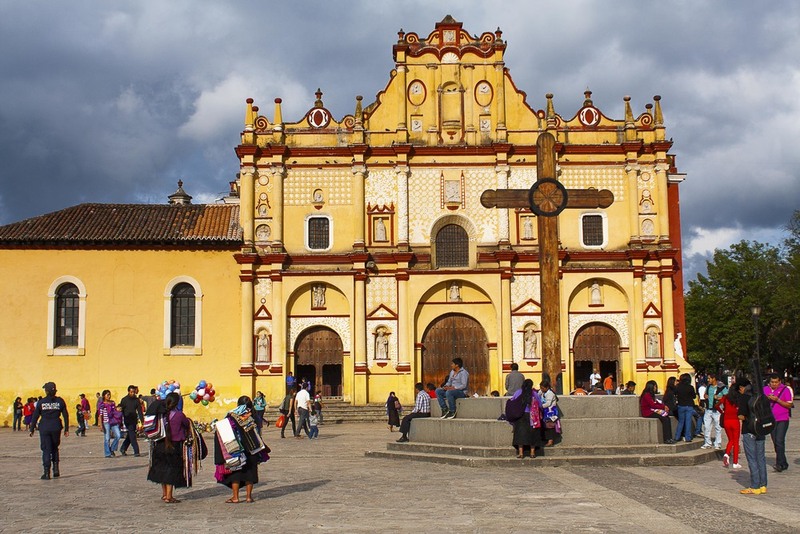 The sprawling central part of the city is a labyrinth of narrow, cobblestone streets with colorful adobe buildings featuring beautiful woodwork trim, elaborate wrought iron gates, and red tile roofs. 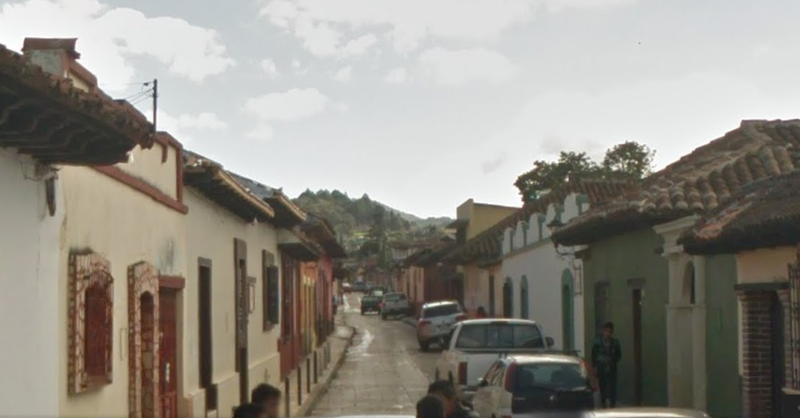 Typical San Cristobal cobblestone street with a colorful mix of Mexican adobe buildings, Mayan woodwork and adobe tile roofs. I had dinner at a sidewalk cafe in the Flora Maria shopping area just across the street from this indigenous Mayan style church. I met a couple from Germany at the hotel and a family from Greece while waiting for a table for dinner. The further south I got, the more street people I encountered. Most of the time it was adults selling fruit or washing windows or car headlights at main intersections. But occasionally, it would be children performing or selling flowers or trinkets. There were indigenous street merchants selling handicraft items everywhere in San Cristobal. I fell in love with San Cristobal. Everything about it was just enchanting. The people, the geography, the architecture, clothing, weather – it was a perfect ending for my trip through Mexico. What started off rather disastrously ended on literal high, far up in the mountains – a world away from anything I had ever experienced before. From studying my map this morning it actually looks as though I have reached a two-thirds point of the way from Kansas to Costa Rica and roughly the halfway point as measured from the Mexican border where I entered. Horray!! While studying the map this morning I realized that am already about two-thirds of the way from Kansas to Costa Rica or roughly halfway from the Nuevo Laredo border where I began my Mexican odyssey just six days ago. Horray! !